Nanocharacterization Techniques covers the main characterization techniques used in nanomaterials and nanostructures. The chapters focus on the fundamental aspects of characterization techniques and their distinctive approaches. Significant advances that have taken place over recent years in refining techniques are covered, and the mathematical foundations needed to use the techniques are also explained in detail. 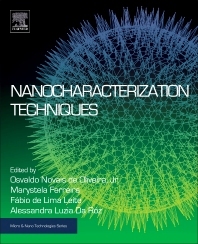 This book is an important reference for materials scientists and engineers looking for a through analysis of nanocharacterization techniques in order to establish which is best for their needs. Prof. Osvaldo N Oliveira Jr completed his PhD at the University of Wales, Bangor, UK. He is a professor at the São Carlos Institute of Physics, University of São Paulo. He has published about 470 articles in refereed journals, 15 book chapters and has submitted seven patent applications. These works received about 9000 citations (as of August, 2016). He has supervised 40 masters and PhD candidates. His main areas of expertise are in nanostructured organic films, and natural language processing. He is a member of the São Paulo State Academy of Sciences. He is a member of the editorial board of three journals, and is also associated editor of the Journal of Nanoscience and Nanotechnology. He received the Scopus Award 2006 awarded by Elsevier in Brazil and Capes, as one of 16 outstanding Brazilian researchers, based on the number of publications and citations. Prof. Dr . Marystela Ferreira received her PhD in Physical Chemistry from University of São Paulo, Brazil. She is currently a professor at the Federal University of São Carlos, and specializes in the following areas: eletrooxidation , thin films , sensors and biosenssores , phenolic compounds , HPLC and MEQC. Fabio Leite de Lima obtained his PhD in Materials Science and Engineering from University of São Paulo, Brazil, Between 2006 and 2009, he was a Postdoctoral Fellow at the Institute of Physics of São Carlos (IFSC-USP) in collaboration with Embrapa Agricultural Instrumentation. He was Fellow Young Researcher FAPESP (2009-2012). He has collaborated with Prof. Dr. Alan Graham MacDiarmid, winner of the Nobel Prize in Chemistry 2000, with whom he published the first article in the Journal of Nanoscience and Nanotechnology, in 2009. He is currently Adjunct Professor at the Federal University of São Carlos (UFSCar) - Campus Sorocaba, Coordinator of the Research Group in Nanoneurobiofísica and Future Scientist Program. He has conducted research the areas of nanoscience and nanotechnology, with emphasis on nanoscopy, nanoneurociência and medical nanobiofísica. Alessandra Luzia Da Róz completed a degree in sciences, with a major in chemistry, and obtained her PhD in Materials Science and Engineering at the University of São Paulo, in São Carlos, Brazil. After post-doc and researcher positions at the São Carlos Institute of Physics, University of São Paulo, and at the Federal University of São Carlos, she is now a lecturer at the Federal Institute of Education, Science and Technology (IFSC) in Itapetininga, Brazil, where she works in the coordination for research and development. Her main areas of research include polymers and their applications, such as in the processing of natural polymers, lignocellulosic biomass and solid fuels.